Wonderful location across the street from the main train stationÃ¢â¬â¢s Europaplatz exit and a nice short walk to the Reichstag and Unter den Linden. Convenient for European travellers and wonderful for sightseeing. Within a short, five minutes of the train station and eight minutes from Brandenburg Gate. 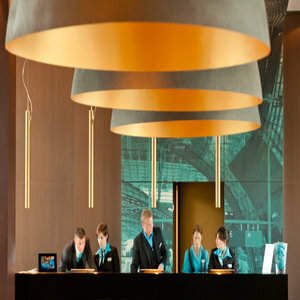 Motel One Berlin-Hauptbahnhof has a spacious lobby with relaxing bar and garden areas. Spacious rooms with fast WiFi and friendly service make this a good option for travellers. A plentiful breakfast buffet is provided along with WiFi for a surcharge. Meals may also be enjoyed in the garden during warmer seasons. Stylish rooms with double and queen-sized beds. Rooms have flat screen, plasma televisions and comfortable furniture. Balconies allow for views of Berlin, and there is free use of WiFi with purchase of breakfast. iPads are loaned to guests in the lobby, where there is also free internet access. Motel One Berlin-Hauptbahnhof is located in Berlin Mitte, near Brandenburg Gate, the Museum for Contemporary Art, the German Chancellery and the Reichstag Building. Also nearby are the House of World Cultures and the Aquadom. Across the street is Berlin train station, where guests find hop-on hop-off tours, shops and restaurants, and trains to many European locales. A bus stops one minute down the road and transports guests to Tegel Airport in twenty minutes for only a few Euros.